Beber Camp has been awarded a Yashar Initiative Grant! The Yashar Initiative seeks to improve accessibility and inclusion for campers and staff with disabilities at Jewish day and overnight camps. This incredible grant will support the advancement of the Beber Camp Yad B’Yad Inclusion Program. The Yad Program is fully inclusive – campers with learning, emotional, and developmental disabilities live in cabins with same-aged peers, participate in the same hobbies and have every opportunity to learn and grown in a fun, safe, Jewish environment. We had no idea what impact the Yad Program would have, both on our participants with special needs and our larger Beber Camp community, when it began eight years ago. Starting with one camper in 2011, and growing to 19 campers in 2018, we have been overwhelmed by the way the Yad Program has become an integral part of Beber. Seeing our campers embrace each other in all their similarities and differences has increased the magic of Beber in a way we didn’t even know was possible. 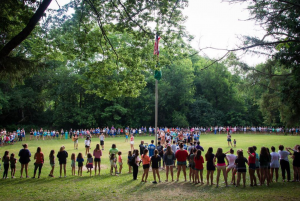 We are so grateful for this incredible opportunity to expand our Yad Program, ensuring that the life-changing magic of Beber continues to remain available to every single member of our Beber Camp family. The Yashar Initiative is generously funded by the Harry and Jeanette Weinberg Foundation, coordinated by the Foundation for Jewish Camp.